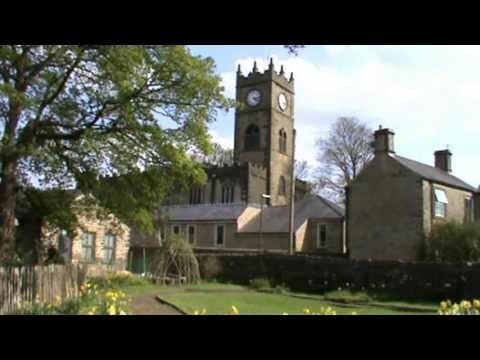 Hayfield is the setting for the Sunday night television series “The Village” this is the fourth of four videos that we have filmed in the area. Hayfield is a lovely village situated below on the west side of Kinder Scout in the Sett Valley between the towns of Glossop to the north, Chapel-en-le-Frith to the south and New Mills to the east. The village was once a staging post on the pack-horse route across the Pennines from Cheshire to Yorkshire the route went up the Set Valley and over the Watershed at Edale Cross, where the old stump of a cross still stands, and descended Jacobs Ladder into Edale. The village is now split into two by the A624 relief road which was built to ease heavy traffic that once ran through the narrow main streets. The west side of Hayfield grew with the arrival of cotton in the 19th century followed by the railway and has now extended down the Sett Valley merging with Birch Vale and New Mills. Even though some stone quarrying still takes place in the area around Hayfield the remains of old quarries and millstone manufacturing can still be seen. Other industries in the village were clog making, charcoal burning and domestic implement manufacture. There were also several cotton mills within the village along with many fabric printing and dyeing businesses as well as paper manufacture and Hayfield became known for spinning, weaving and calico printing. The railway branch line linking Hayfield to Manchester was built in 1868 firstly to carry fuel to power the mills but closed in 1970 as part of the Beeching cuts. The railway also brought many visitors to Hayfield and the car park, now the bus station and information centre, was the railway station. The dismantled railway track bed leading from the back of the car park is now the Sett Valley Trail which follows the River Sett to New Mills. Along the 2½ mile trail there are plenty of benches, a reservoir and wonderful views of the surrounding hills. Hayfield to the east of the relief road is the olde-worlde part of the village with some wonderful old terraced houses, cottages, farms, shops and pubs. The River Sett that flows through Hayfield and Birch Vale rises near Edale Cross on Kinder Scout and joins the River Goyt at New Mills. Kinder Road the no through road that goes off round the back of the Royal Hotel leads to Kinder Reservoir and Kinder Downfall on the west side of Kinder Scout. The road passes a pub the Sportsman and Bowden Bridge quarry the starting point of the famous Mass Trespass over Kinder Scout in 1932 which is now a car park with public toilets and picnic tables. Opposite the car park there is Hayfield Camp Site for tents and Motorhomes only (no caravans). The Snake Path also leads off Kinder Road along William Clough to the Snake Inn. There are two churches in Hayfield and the Church of St. Matthew was relocated from Kirksteads in 1386 and was not completed till 1405. The tower was built in 1793 and raised in 1894 adding a clock. St. John’s Methodist Church dating back to 1782 claims to be the 13th Methodist church built. The four walls of the main church are original even though it has been added to. Methodism was prominent in the area which led to several other chapels being built. Arthur Lowe the actor who played Captain Mainwaring in “Dads Army” was born in a terraced house in Kinder Road and there’s a plaque on the wall where he lived. He helped to raise the money to buy the cricket ground next to the Royal Hotel in 1976 by bringing along a team of cast members of Dads Army, including Bill Pertwee, Ian Lavender and Arthur Ridley (Private Godfrey) to take on the Hayfield team captained by Ron Heron. Dads Army lost the match by 25 runs but the event raised several thousand pounds. Arthur was well associated with the cricket club through his father Arthur Lowe senior who was chairman for 22 years until his retirement in 1968. The Arthur Lowe Memorial Cup is still presented to the winners of the League Junior Under 17s. Hayfield lies on the Pennine Bridleway and is a traditional starting point for the ascent to Kinder Scout and Lantern Pike making the village popular with walkers, mountain bike riders and fell runners. Kinder Scout at 636 metres is the highest point in the Peak District and is a high windswept upland grit stone plateau which rises steeply from the surrounding ground and the edges are studded with rocky outcrops, crags, boulders and large stones that are very interesting due to some of their shapes that resemble animals, fish, people and many other objects putting the imagination into over drive. The huge moorland plateau of degraded blanket bog is a Site of Special Scientific Interest and a designated National Nature Reserve. The erosion of thousands of walking visitors, over grazing, wildfires and atmospheric pollution has led to areas of bare peat which are in danger of being washed away, forming deep gullies and releasing carbon into the atmosphere. The National Trust started a programme in 1982 to restore the area and even though it is regaining its former glory the battle for Kinder Scout continues and restoration will continue up to until 2015 costing £2.5m with the help of United Utilities and Natural England. The famous Mass Trespass took place in 1932 when nearly 500 working class ramblers, locals and members of the “Right to Ramble” organisation gathered on both sides of Kinder Scout to walk on the private land. After a brief but vigorous battle with landowners and game keepers who tried to stop the trespassing onto the land the walkers marched on to Ashop Head. Some ramblers were later arrested and some of them received jail sentences of several months on charges of incitement and riotous assembly. The ramblers were inspired by the dramatic scenery of Kinder and the Mass Trespass was a campaign for better access to the countryside and its success led to the creation of the National Parks in 1949. In 1951 the Peak District National Park was established and Kinder Scout opened to the public for the first time. Kinder Downfall is the tallest waterfall in the Peak District and lies on the River Kinder where it flows west over the edge of Kinder Scout and into Kinder Reservoir. In the winter and when in spate the waterfall, with a 30 metre drop, is very impressive and when there is a strong westerly wind the water is blown back on itself resulting in a cloud of spray that can be seen from several miles away. In very cold weather the waterfall freezes providing mountaineers using ice axes, ropes and crampons an icy challenge but in the summer it is little more than a trickle. The River Kinder only 3 miles long rises on the peat moorland plateau and flows westwards over Kinder Downfall and through Kinder Reservoir to its confluence with the River Sett at Bowden Bridge. Kinder Reservoir was built in 1911 by the Stockport Corporation Water Works and took over nine years to build employing and housing over 700 navvies who were transported from Hayfield to the construction site on the special standard gauge railway. Kinder Low at 633 metres is one of the highest points in the Peak District only 3 metres lower than Kinder Scout. From the pillar on the summit the views westerly to Wales and easterly to the Kinder plateau are fantastic. Edale Cross situated on the former Hayfield to Edale road under Kinder Low and immediately south of Kinder Scout marks the junction of the three wards of the Forest of Peak, Glossop and Longdendale, Hopedale and Campagna. The first cross was possibly set up by the Abbots of Basingwerk to mark the southern boundary of their land granted in 1157 and the current cross, with uncertainty, is possibly Mediaeval. At some point the cross fell down and was re-erected in 1810 and this was when the date and the initials of the local farmers, who raised the cross, were carved into the stone. We park in Hayfield car park and cross the road using the underground crossing which brings us out at the George Hotel car park. We walk down the side of the pub and turn right onto the road then left at the junction then left again onto Valley Road. After a short way we turn left over a stile in the wall and walk down to follow the path at the side of the play park and tennis courts. At the end of the park we turn left and make our way up to Kinder Road and turn right. We follow the road past the Sportsman Inn, Bowden Bridge car park and the Hayfield Camp Site until we come to the end of the road. We head straight forward following the bridleway with the Kinder River on our right. At the end of the track we go through the gate on the left steeply uphill then follow the edge of Kinder Reservoir until we reach a footbridge. Here we bear to the left at the sign for William Clough and follow the stream on our right which we keep crossing from left to right and right to left uphill. We clamber up and over a rocky out crop head forwards then up some steps. At a cairn we turn right onto the Pennine Way making our way up to the top of the hill. We pass a large cairn and keep heading forwards still uphill then the track levels and we keep following the track which eventually bears left round a gully to Kinder Downfall. We cross over the top of the Downfall and turn right and keep following the Pennine Way crossing over the top of a gully and to the right of Kinder Low’s summit then bear left to a cairn then slightly left again to pass to the left of Edale Rocks. We head forwards on the track downhill and turn right at another track coming in from the left. We head forwards then keep bearing right round the hill of Swine’s Back until we come to a wall. We turn left downhill to a gate and turn right onto a track. Notice Edale Cross on the right. We now follow the track downhill ignoring the paths off to the left and right. We pass a farm at Coldwell Clough and bear right now following a tarmac track to two gates. We take the gate on the left and follow the bridleway uphill then right at a path coming in from the left and then left uphill at the sign post for Hayfield 1¼ and follow the stony path. We go through a gate and take the path on the right downhill. We follow the path through the trees passing Hayfield Camp Site on our right. We then follow the track back to Hayfield with the river on our right then make our way back to the car park. This is a hard too strenuous walk with steep inclines and declines on footpaths and tracks of which some are quite stony. Approx 10 miles allow 4 hours 20 minutes using OS map OL1, The Peak District. Dark Peak area. Start Point: Hayfield pay and display car park which is £3.60 for all day. Hayfield near New Mills is located between Glossop and Chapel-en-le-Frith in the Peak District of Derbyshire. Travelling from the north turn off the M1 at junction 37 and take the A628 towards Manchester. After passing the first reservoir take the next left the B6105 to Glossop then take the A624 to Hayfield. To reach the car park turn right at the road for New Mills and immediately right at the Kinder Lodge pub. Travelling from the south turn off the M1 at junction 29 and take the A617 to Chesterfield then the A619 to Baslow and the A623 to Chapel-en-le-Frith then take the A624 to Hayfield. To reach the car park turn left at the road for New Mills and immediately right at the Kinder Lodge pub. There are public toilets in Hayfield car park, in Bowden Bridge car park and at New Mills. For refreshments in Hayfield there is Rosie’s cafe, two shops and four pubs The Kinder Lodge, The George, The Royal and The Pack Horse. There are also more pubs and shops towards Birch Vale and at New Mills. There is also the Lantern Pike at Little Hayfield.